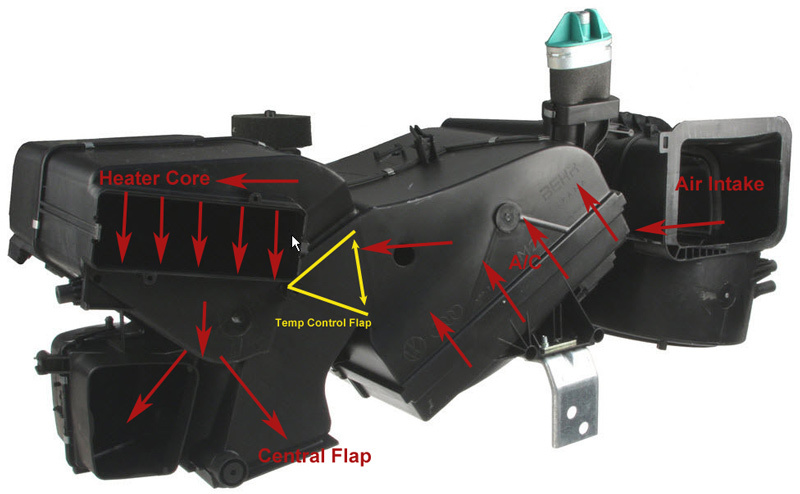 I've asked a few questions about this in other threads, including elduderino200's epic heater core thread, and I've read nearly every thread about the heating system both here and on audiworld, so I've done as much research as possible. Now I just need to figure out my exact case. - If I feel the pipes connecting to the core at the firewall they are both very hot. As far as I can tell they are both nearly as hot as the coolant tube going into the radiator. The outflow pipe is maybe a teeny bit less hot than the inflow pipe, but it's still damn hot and I can't keep my hand on it (the rubber portion) for more than 5-10 seconds. This leads me to believe that my coolant flow through the core is ok.
- No HVAC error codes. - The temperature control blend door flap was the next likely culprit. After doing much homework I figured out which motor it was behind the center console and I can see the motor working properly while I dial the temperature. So the motor itself is fine. - It was a huge pain, but I finally managed to pop off the arm from the motor so that I could try adusting the blend door by hand to feel if it was opening/closing. (See pic below, made using a random HVAC pic I found from google.) It sure feels like it's opening and closing properly. Some threads on other forums have reported of disintegrating foam either around the edges or on the face of the door itself, but I can definitely tell a very distinct flow difference between the two end positions, which makes it seem as if the door is sealing the air. When the heater is closed off I get a very strong airflow from the blower. When I switch the door to the heater position the pressure of the air flow drops a bit as a result of flowing through through the heater core. Is it normal for the air pressure to drop a bit? But either way it's not getting hotter. I'm fine trying a core flush, I may as well, but I just wanted to do all my homework first. Is it possible for the pipes to still be very hot even if the flow is severely restricted through the core? If it's the flap then I'll have to take out the HVAC unit per elduderino's thread, but I really want to be sure before I do that. I wish I could get my hands on a tiny camera on a tube that could slide down the central vent so I could get a look at the inner flap. I think they sell something like that Autozone but I doubt it would be worth getting. Could it possibly be anything besides a clogged core or a busted temperature control flop? Here's another picture I threw together. The photo I downloaded, but the annotations are mine. I *think* this is how the HVAC unit works, but not sure if I messed anything up. First, if we think about this logically, when you say the coolant going into the core is hot and coming out it's still relatively hot, it makes me think it's not being cooled down (duh). You're sure the motor is working, and it's connected to a fan that is also in good working order? Unfortunately I have no idea how to check either of those. Second, Autozone does rent tools. I parked in their parking lot when I was troubleshooting my coolant issue. I rented a coolant system pressurizer and figured out a few things all while parked right out front. Then just went in with the tool and my receipt and they gave me all my money back (in cash!). Third, you said when you adjust the heat to higher or lower on the dial, you CAN see the motor working? i.e. it IS moving a small amount as if it was opening and closing the door more? 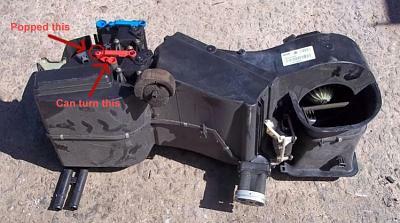 I only ask because if the motor works, could something have popped off of it? Also, would this indicate a temp sensor working correctly? If it isn't recognizing it's outputting the temp you asked for with the dial, a sensor might be shot (which I figured out in my whole issue, is actually a fairly easy fix). Last edited by elduderino200; 10-30-2013 at 03:20 PM. Don,t throw any parts at the car yet. Do your self a favor. Disconnect both hoses at the heater core , flush out core with fresh water , blow out water with air hose , fill heater core with CLR , let sit over nite & flush with fresh water in morning. Reconnect heater hoses , fill cooling system & see what happens. It should get hotter , if not repeat several times. 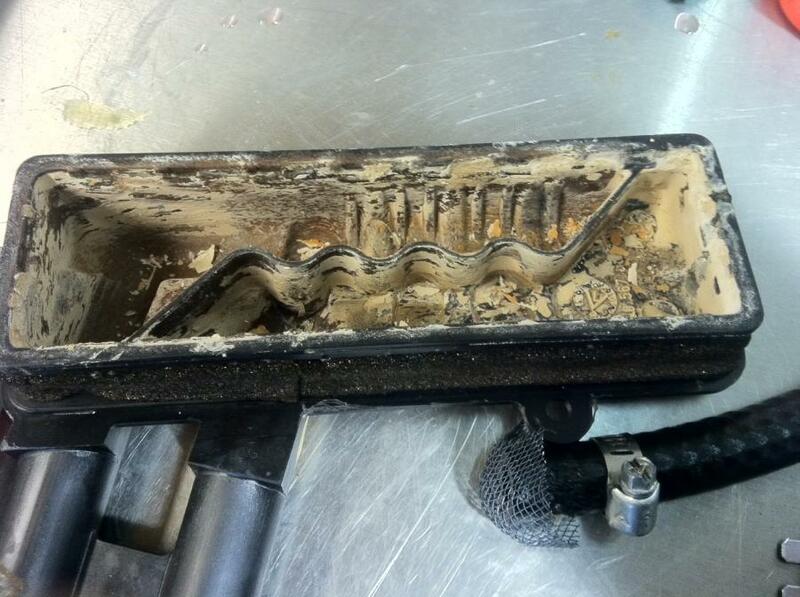 The inside of the heater cores crust up with dried antifreeze over the years. Right, but that would be expected if there were little or no air actually blowing through the core right? I wouldn't expect the coolant to lose much heat through the core without air blowing through it. Hence the mystery: it seems like coolant is flowing through the core, AND that there is air blowing over the core. And thanks for the Autozone tip. Ahh ... I have a theory now based on the crusting up comment. It makes sense: if there's a consistent layer of crust, then the hot coolant could flow through the core but the crust will basically act as an insulator, causing the coolant to not lose heat through the core. I always thought that a "dirty" core just meant that there was gunk sitting at the bottom of the core restricting flow, but that the coolant could still transfer heat in the rest of the core. Ok, that settles it. I'll try the flush and report back. I've never drained/refilled the cooling system ... is there a good guide to making sure that you refill the system properly and prevent air bubbles? I'm sure there is somewhere, but any pointers would be great. Do you mean VAG-COM codes? if you don't have a VAG-COM you can also pull HVAC codes by this method. If there are no codes, I'd bet on some problem with the heater core. You don't have to drain all the coolant out to flush it. Those heater hoses are at a pretty high point in the system. But as others have said, I'd flush the hell outta that core. If there is stop-leak crap in that system, it might clog up again unless you thourghly flush out the entire system. So did you do what i recommended? You have a clogged heater core , no heat transfer , get about a dozen of these each fall. Look at the basics before looking for a electrical problem. are you Atlantic time zone or still EST way out there? I have had massive amounts of heater core problems (you can look up ALL my threads). Your hoses COULD be hot, but with air in the system, heat wouldn't blow out consistently. To bleed the system. On the OUT hose (passenger side of core) on the heater core, there should be a small hole on the hose, you can pull it forward and pour coolant in until it comes out of the hole, then quickly move the hose back on (there are many DIY on this site). Is your temperature sensor on the Dash behaving NORMALLY? Get into the onboard HVAC diagnostics as mentioned above, and see what temperature the system is reading. Air flow will decrease a bit when changed over from normal to heat. It could be your coolant temperature sensor (small cost), if you had a vag com, you could pull all the codes on your vehicle. 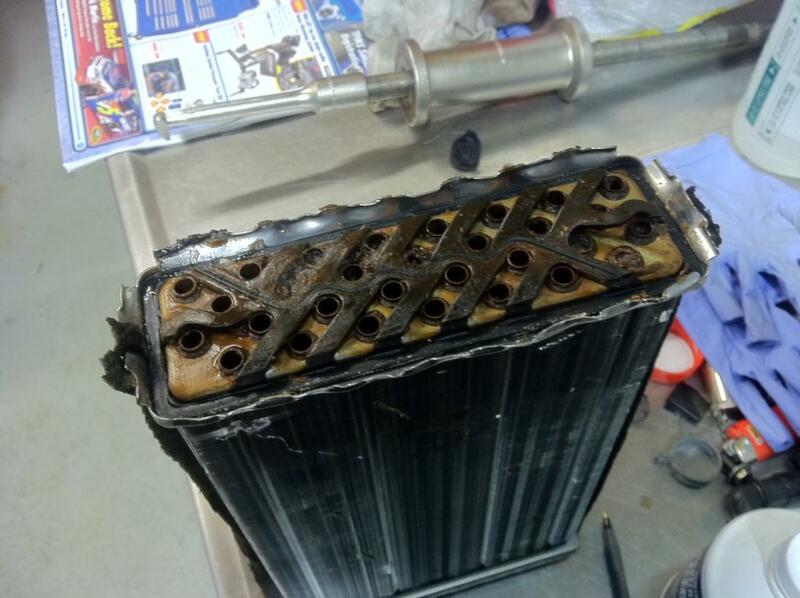 I would definitely clean your heater core with the CLR method. However, if you put a water hose on the in side and water comes out the out side normally, then I highly doubt it see pics attached of a REALLY bad heater core of mine. With a hose on one side, I only got a trickle coming out the other side. IF you have a small, tiny, tiny leak in your system, even one where you do NOT notice the coolant evaporating, your heat will not work, you can pressure test the cooling system as well to make sure. Off the top of my head, that's all I can come up with. I'm leaning towards there being AIR in your system, hoses will still be hot at that point since water will flow through, then stop, then flow through and your heat will not work. It's the foam covering the flaps inside the heater box that have disintegrated & that is letting air thru the holes in the flaps. HELP! NO HEAT! ITS COLD! How do i diagnose climate cont on '01 A4?